"It's been too long since we practiced this, buddy," Galilee said as she gathered the net up in her arms. She was knee-deep in the shallows, the waves splashing against her thighs and tugging at the cordage that drooped in the briny water. A dorsal fin breached the surface, and a whistle answered. "Eh-eey?" "Gimme a second," replied Lee, managing to get a better hold on the net. It was well-woven, but cumbersome, and really meant for multiple Luperci to stretch through the water than for one to cast out. The cove was small, a bite taken out of the coastline, but there was plenty of space for startled fish to swim past once she tossed. Once she was as ready as she'd get, she stuck two fingers in her mouth and whistled. Hurley disappeared, swimming out into open water. He was not gone for very long. Separating a small group from a shoal that lingered in the shallows, Hurley deftly herded them back to the small cove. He jumped out of the water to shout "Alalee!" then submerged again, his broad tail slapping the water. At that slap, Lee flung the net. Darting to the side to avoid getting tangled, Hurley went flying after the fish that escaped, chasing them into the nooks and crannies of the rocks. He snapped up one, two, while Lee wrestled the net full of flopping creatures back toward the shore. Once she dumped the fish out onto the dark sand, though, she realized that she'd only managed to capture about three -- four, if she counted the one now flipping wildly back toward the waves. She yelped and pounced for it, but it slipped between her fingers and vanished as the ocean receded again. Hurley's smooth head appeared with a different fish in his jaws. He stared at her and her measly flopping catch, then cackled. Galilee clicked her tongue at him, and he spat the fish out, clicking back. 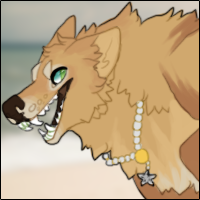 The noises escalated until Hurley finally shoved himself onto the beach, opening his jaws in a mockery of a wolf snarl. His tail waggled up and down behind him, and laughter brightened his eyes. The shores of the ocean had not been new to the dark male, having not only lived near them when he had picked out his home, but also using it as a pathway to make his way from outside Sapient back in; and vise versa. Then again, never could he recall there being so much in one stretch of land. Living in the spot they had, or rather with they shape of their territory, it was favored more towards the forests of Gaspesia more than anything else. A soft sigh passed through Hibiki's lips as his feet carried him down the dark shoreline. For starting to get into autumn, the weather was nice, and there wasn't any noise aside from the crashing waves making contact with the sand. It was... peaceful. Something he always seemed to lack in his life prior to coming here. As the monsieur neared the cape, ears turned up to the sound of someone in the distance. He was still within the boundaries of the court from what he could gather. The scent of the pack was terribly mixed in with the ocean salt, but it was just there enough to pick out. This had to be another pack member unless someone... really cheerful had been stupid enough to trespass. Still, his hand instinctively reached for the knife at his side, inching closer with caution. What the dark male saw was something he hadn't expected. A woman who's pelt looked like a bright flame interacting with an animal he had never seen before. With net in hand, the two worked in time with one another, his light blue gaze following the woman as she dragged the net of four... no three fish to the shore. He couldn't help but slip a small chuckle when one of them got away. There was no need for the knife. Hibiki's hand drifted away from the weapon, straightening his posture as he approached the pair. Of course, true to his nature, he kept some distance between them until she was more comfortable with him being there. Arms crossed gently, smile moving over his face as his fingers trailed along his arms, "Need some help with that madame?" The friends traded insults -- ones they'd learned from each other's cultures -- until Hurley spotted someone walking down the beach. With a last click, he swung his muscled body around and threw himself back into the water, then swam out a few yards until he had room to swim around. His eye peeked above the surface while Galilee, putting her hands on her hips, turned to see who'd interrupted their match. "Help? Oh, with that," she said, glancing at the net. She doubted the man was about to offer they tag-team wrestle a dolphin. She flashed him a grin that showed too many teeth. "If you want! It's easier with two people to hold the net, big as it is." Inviting him over with a jerk of her head, she then whistled at Hurley again; the dolphin whistled back and swam off, propelling himself with his strong tail. Galilee made sure her trio of fish were set far from the water, then began to untangle the net, walking into the shallows and indicating that the other Courtier grab the other end. "I'm Galilee Haskel, and that out there is Hurley," the wolfdog said, looking the wolf over. He was tall and muscular, someone she thought would be fun to take in a fight. Maybe she should have invited him to wrestle dolphins anyway. "Who're you? I've not met you before -- you're new right?" Lee knew pretty much everyone in the pack by this point; she was far from shy in her element, and the entire Court was her element, full of friends and family. Light blue gaze moved over to the animal in the water, it having noticed him before the golden woman had. She seemed to be a little upset that it had retreated back out into the water before her attention turned on him. That then turned to excitement, having heard his offer to help her with the net. Ears pulled back slightly at the amount of teeth her smile had, but brushed it off quickly. They now had a task to do, and he would have to play his part. With a smile and a nod, he made his way to the opposite end of the net, waiting for her instructions. Hibiki observed the woman, watching how she untangled the net from her side, so it was only fitting that he did the same. His hands were careful, not waiting to make any holes where their catch might be able to escape. Then she began to move out into the water. It was cold to the touch, the ocean being one of the things he had yet to experience in his life; kind of strange considering he lived near the ocean back in Sapient. A smile moved across the dark male's face as the woman introduced herself and the animal that seemed to be assisting them in this task, "It's a pleasure to meet both of you. I have never seen anything like Hurley before." Finally getting used to the water, he positioned himself better so that they would be able to catch more, "My name is Hibiki, and yes I am new. I came to the court after Sapient's disbandment. Kalypso heard about it and invited me to come join." It wasn't really important, but he did value that one friendship he had. The cold waves lapping at the back of her knees, the constant force of the sea pulling like an insistent child tugging on a shirt or tail -- none of it was a thought in Galilee's mind. She considered a life by the seaside an exoteric idea rather than somethinig unique and obscure. Even though her father had tried to keep her from it, the ocean had been there all her life -- and if it were gone, she would miss it as keenly as she would notice the disappearance of the sun. Hibiki, as he soon introduced himself, seemed to take some time to get used to the sensation. He was careful with his hands, methodical in the way he handled the woven rope net, and she could appreciate that though her own tugs at the net were rough. As long as she had someone else pulling at the other end, they were sure to cover more area and catch more fish by default. He's great, isn't he? Lee said of Hurley, smiling out at the water. A low, mocking whistle from the water revealed that the dolphin had heard this, and she immediately stuck her tongue out at him. Oh shut up, arrogant salaud. Oo uh-uhk! quipped the dolphin childishly, and with another slap of his tail (spraying some mist in their direction) shot out into deeper waters to round up fish. She could still see his fin above the surface at times, though he would dart back down, seeking a school of shallows-dwelling animals. He weaved around through the water while Lee looked back at Hibiki. I'm sorry about Sapient. What was it like -- was it very different to here? She'd never known very much about the pack thanks to its distance. 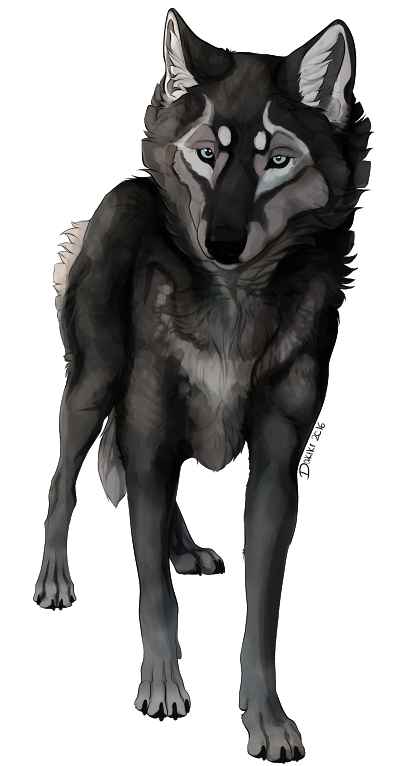 Her father hadn't had dealings (good or bad) with the group either, and Skoll was where she gathered most of her information from (taking his opinions with a grain of salt, of course). 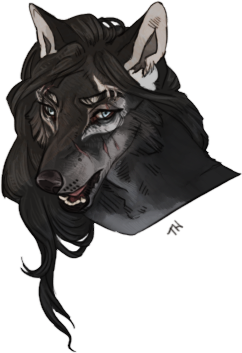 Odalis had been born there, she knew, though the girl had been whisked overseas to Onuba in her childhood, and her view of the pack would be different from those of a man who had grown up there. You about ready? she howled across the water at Hurley. When there was no answer, she rolled her eyes then looked back at the dark wolf. We'll just walk this out a little deeper and stretch it tight when he drives the fish here. Once they reach us, we gotta fling it out to them -- or let them hit it, I guess -- then gather them all up. That sound okay? The chill of the ocean was unlike anything he had felt before. Sure, there were times when the water back home and the cold of winter bit at him, but it felt much more apparent when the water constantly moved about his fur and skin. He had been unlucky enough to inherit his mother's jackal fur, short and sleek. It was easier for the forces of nature to share their heat or cold with him, even though he did not like it. So long as she was fine with him taking the time to adjust to the temperature, he was more than willing to follow through with his offer for help. Light blue gaze moved back over the water, smaller waves beginning their formation splashing at his torso as he watched the fin of Hurley moving about the surface. The two of them had a small bickering with one another, to which the dark male couldn't help but let out a chuckle. It was certainly an interesting relationship, "If you don't mind me asking, what kind of animal is he? Are there many more like him around here?" In the water of course. It didn't seem like this kind of animal could move on land like they could. Sapient had been put in the past. Nivosus had done so many things behind the pack's back... it was a wonder he had been the leader of the pack for so long... and only now the dirt had been dug up on what he had done. Guess he was really good at hiding things. He gave a small shake of his head, "Different yes. There was a great emphasis on focusing for knowledge and wealth while the court has a great sense of nobility and honor. To be honest, I like it much better here than I did in Sapient." Here, he felt like he belonged, not like there. Hibiki's gaze moved over to the golden female as she explained the plan, "Sounds good. Once we move out to when you want, I'll start moving to the side so we can use the whole space of the net." It would give them a better chance of catching more so long as they didn't catch Hurley along with it. It would mean they would have to move a bit faster once the fish realized they were going to be cut off. Shouldn't be a problem so long as his body could adjust to the water in time. He may just have to tough this one out. 00+ We can wrap this up whenever you'd like! I got my co-rank out of it. :D Or we can continue for more fish/dolphin adventures -- I don't mind either way haha! Oh yeah, Hurley? Galilee tugged at the rope and glanced out where the dorsal fin cut a path through the undulating waves. He's a dolphin. It's a type of fish, but they're really smart -- she tapped a claw to her forehead -- and they can breathe air. It had taken her a long time to realize this fact, though it should have been obvious that Hurley's understanding of her need to breathe came from experience. She had poked around his blowhole until he'd thrown a fit, and the same day she learned its purpose she learned that he could jettison mist into her face with a snort. They live in groups out there. Kind of like packs and families. Lee shrugged, smiling. I've not gotten to meet any of Hurley's pals, though, so I dunno if they're very much like him. Galilee wagged her tail and shot him a broader grin as Hibiki revealed he preferred life in the Court to that in Sapient. Well, we're glad to have you. She was proud of her home, and she thought that honor was more important than wealth anyway. One could have all the riches in the world -- fancy garments, books, weapons -- and that meant nothing if it was used for ill. Besides, if those things were stripped away from Lee, she knew she had family to fall back on. The tall male agreed with her plan, and Lee nodded. She looked back out to the water, waiting until she saw Hurley's signal accompanied by his high whistle, and then she barked at Hibiki. Pull! The dolphin shot forward, driving the frantic fish toward the shallows once more. He pulled up short before they reached the beach, his powerful tail pushing him back, as the fish struck the net that the Luperci stetched out. Galilee whooped, then realized they had to close the net up on them; the fish would only panic and push against the cords for a moment before just turning around. Almost stumbling in the water, she tried to meet Hibiki and wrest his half from him. Fish thrashed around in the netting that she bundled up, the smallest ones slipping out from between the holes, but the larger trapped by the weight of the rope. My God I think we did it, Lee said, trying to shove the heavier bounty onto the sand. They'd gotten at least a dozen decent-sided fish, far better than her measly three. Hibiki had never really seen much fish either now that he thought about it. Again, the idea was so strange to him. For having a home that shared the lines of the beach, being the pack or his own house in general, how had he not had the chance to see something like this? The court was full of so much more learning than he had first thought. Plus, it helped that he was able to assist those in his new home while doing so. The point she had brought up soon afterwards made him think for a moment. So dolphins lived in their own packs, but she had not had the chance to see the others from Hurley's little pack. One hand moved out forward as if he had come to his own conclusion, "Well, if they are anything like the Court or other packs around here, I would think that those in Hurley's pack are different from him, have their own personalities to them just as all of us do." It made logical sense anyways. The dark male offered Galilee a smile before turning his attention back to the task at hand. They still had the fish to catch. Light blue gaze followed the movement of the fin sticking out of the water, watching as it made its way towards the net. To his amazement, the dolphin was not only able to stop short in time, but also was able to move backwards with such a relative speed in the water. Now it was on the two luperci to finish it. He moved forward, doing his best not to allow the cold water to get the better of him. At this point, he was just going to have to move fast and deal with the chill later. As the net closed in on the opening, he offered his portion out to his companion, letting her close it off and the two of them dragging it to shore together. A dozen good sized fish was a pretty good catch. He gave her a nod, his hands moving up to his arms as the chill began to catch up with him from his earlier actions, "That was exciting. Why don't we get these back to the court?" Figured we could go ahead and wrap this up. +300 words.